Hillary Clinton visited Stanford on Friday to discuss technology and democracy and the fraught relationship between the two (TIFFANY ONG/The Stanford Daily). 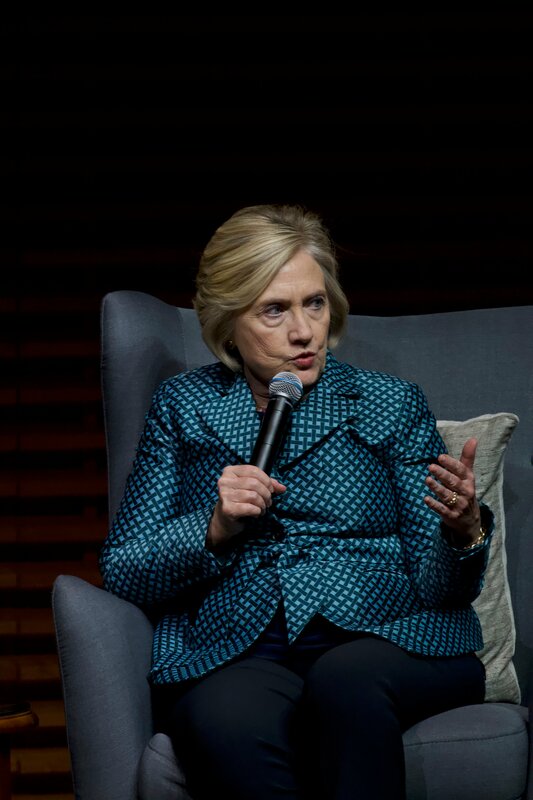 Topics ranged from her loss in the 2016 presidential election to her initiatives as Secretary of State to her prescriptions for America’s future. Clinton expressed hopefulness about technology’s potential for good but also framed its misuse as an urgent threat. Clinton’s talk, entitled “Digital Technology, Diplomacy and Democratic Values,” was part of the day-long launch of the Global Digital Policy Incubator (GDPi), a project created by the Center on Democracy, Development and the Rule of Law (CDDRL) at Stanford’s Freeman Spogli Institute (FSI). Larry Diamond, a senior fellow at FSI and a former director of CCDRL, gave opening remarks and touched on the other talks and workshops that had taken place earlier in the day as part of GDPi’s launch, explaining the importance of studying the problems the GDPi is intended to address. Clinton gave a prepared statement, then participated in a discussion with the Executive Director of GDPi, Eileen Donahoe JD ’88 MA ’89, who served as the first American ambassador to the United Nations Human Rights Council under President Barack Obama and worked for Clinton at the State Department. Toward the end of the event, Diamond asked Clinton a selection of questions from the audience. A recurring topic of conversation was the presidential election. Clinton also talked specifically about the prevalence of “fake news” during the 2016 election cycle. She lay part of the blame for fake news on politicians, who she said have for years been creating “a very partisan environment…where the truth was perhaps made more elastic than it should have been.” But she also emphasized that America is facing a newer, more acute dilemma, where truth and facts have lost their power in American political culture. Clinton specifically referenced the false report spread on social media that claimed that she and John Podesta were running a child trafficking ring out of the basement of a pizza restaurant in Washington D.C. The fake story eventually led one man to bring a firearm to the restaurant in an attempt to rescue the alleged child slaves. Clinton criticized the news media for failing to adequately challenge political falsehoods and investigate important stories such as the Wikileaks hacking of Podesta’s emails; she also castigated social media and technology companies. She argued that technology has “accelerated and made all pervasive” the spread of fake news. In her prepared remarks, Clinton offered five recommendations for the future. First, she said, the U.S. government needs to focus on cyber security, particularly through developing public-private partnerships between corporate America and government agencies. Second, she said, the government needs to demonstrate toughness in response to Putin to force him to back down. Third, Clinton recommended that America “close legal loopholes in our election process” that allow political advertisements on the Internet to go unregulated. Fourth, Clinton emphasized the importance of determining the full extent of interference in the 2016 election. “Otherwise, we will not know exactly what needs to be done to halt this activity now and in the future,” Clinton explained. Clinton also discussed the past successes and future potential of technology in aiding the cause of democracy, citing myriad ways in which technology helped voters on Election Day in 2016. She also brought up the example of an app she helped spread as Secretary of State that allows dissidents living under authoritarian regimes to press a button on their phone that notifies friends and family that they are about to be arrested while simultaneously deleting all of the contact information on their phones. On the whole, Clinton expressed a belief that the technology industry can fix the problems it helps to create. Speaking specifically to the students in the audience, Clinton emphasized the importance of getting and staying involved in politics, no matter how disappointing the results of the last election might have been.